As we each move through our individual lives on this planet, we come in contact with seemingly innocence trivia, that later we often reflect upon as being something that changed our life in one way or another. Also, some of us often think of God, The Creator (or whatever name we choose) as distant from us, unable for us to actually see Him, except we are told He is always with us. “They” must mean around us, within us, or something like that. These are my words – you the viewer probably have your own words and thoughts. We have run onto something that we think our viewers might consider interesting. So, here it is. You make your own judgments and thoughts. But, we feel it is acccurate, correct and if we were to take the same trip, (we would love to!) we probably would have similar feelings and thoughts – the only difference perhaps would be the visions we would see may be different due to our background and experiences. But then, we are each different (thank God) and that is the way it is. These experiences are of Jerry Wills, whose web site you can go to later. Obviously it is impossible to show a picture of the entire universe(s) on this tiny page. To us this shows how small we all are – but an important part of the whole! 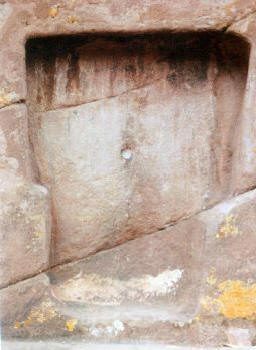 The Doorway of Aramu Muru, located within the Hayu Marca mountain region of southern Peru and about 35 Km from Puno, has long been revered by local Indians as the “Place of the Gods”. This area has not been fully explored due to the rugged mountain terrain. Many of the rock formations found here resemble artificial structures. Jerry: “My experience here has been fantastic! I believe I have actually been through the doorway, traveling into another dimension past the universe.” On November 11th, 1998 at about 10 pm Kathy Wills and others in attendance witnessed Jerry Wills vanish for a short time. Upon his return, Jerry described his experience as a voyage beyond time and space and past the known universe to a place where the universe is kept in balance by a supreme presence. Although it is impossible to validate what happened when Jerry vanished, it is certain that he was gone for a short time. See below for Jerry’s experience. There have been those who have witnessed powerful events here – unexplainable events that have frightened them. For example, tall men, sometimes preceded by or accompanied by glowing blue or orange balls of light, have been seen walking through or appearing near the doorway (glowing ). These have been seen continuing on to the shore of Lake Titicaca or some other undisclosed location. On other occasions, figures have been seen to return to the doorway and silently vanish. For those who live here, there is no question who these visitors are. Legends tell them clearly it is the return of ancient gods. Examining the doorway and the outcropping of rock it is placed upon reveals nothing more than the obvious. This unusual rock outcropping is roughly 60′ thick, jutting upward like the fin on a fish, to a height of about 40.’ A portion of the “cliff wall” has been prepared to a smooth surface. To the left and right of the doorway there are semi circular indented columns that go almost to the top of the wall. In the middle is the doorway – small in comparison to the wall, yet large enough for a “normal” sized individual to almost stand upright in (I use the term normal here because I am almost 7� tall). The doorway is indented about 8″. The interesting thing about the shape of the doorway is its footer. There are two obvious places that have been smoothed and indented. The spacing is exactly right if you were to kneel before the doorway as if in prayer. At the exact place you would rest your forehead, if you were to lean forward, is a cupped depression. Otherwise, this is solid stone with the doorway exactly oriented and opening to the West. As stated, it is believed the doorway is a place leading to where the gods reside. Those seen returning are believed to be inspecting their Earthly domain. But, it doesn’t stop there. I have been told by several different people these visitors occasionally travel on to Cusco – the center of the Incan empire, and I have been mistakenly thought to be one of them. Like me, they are tall with long light hair and fair skin. While visiting small, remote communities throughout the Andes the result of my arrival is always treated the same – the inhabitants of these communities are shocked and surprised by my arrival, thinking I am the return of Pachacutec or one of the other legendary gods. Their belief is that before the beginning of the �next� world these gods will arrive to inform them of the impending destruction and world wide change. Once the people of the kingdom are informed and prepared, these gods will (at the appointed time) take them to safety. According to the ancient time table, that time is imminent – every village I have visited is waiting for the return. UFO reports and sightings where personal contact has been established are numerous and frequent. There is a connection between these sightings and the witnessed gods. Both entities look the same in the way they are dressed and their actions while visiting, with one exception. Those coming from the UFOs are seen more frequently and their message is more deliberate. My (Jerry Wills) experience with this doorway have been kept personal up to now. I believe it might be a good idea to relate my experiences briefly. My reasoning is basically this, because of what I have personally witnessed, I know there are events in our near future that will soon cause a substantial change in the world. These changes are important as to how we continue as a race and how we will eventually need to see ourselves in a greater picture during the coming process of our continued evolution. My experiences are not solely related to this mysterious doorway, but also include contact with those others who have arrived in the frequently seen UFOs. Because the subject of this article is the doorway, I only mention the contact experiences as a point of reference. I will relate these other experiences within another article. I have been through this doorway. And though I do not fully understand the exact nature of how it works, I do understand how it is opened. I cannot say how it is completely controlled – but I know it can be controlled. I know this because of the individuals met while in Peru that have come through the doorway. Though they have not given up their secrets, they have hinted at the manner through which it is activated. Using this information I recently went through and found myself on the other side. It was nothing I had expected… It is true this is a portal to another place. After taking the steps necessary for entering (or opening) the doorway, I was seen (by those with present) to fade away until completely gone from sight. There was no glow or other effect witnessed. I had, to them, simply vanished. What I experienced was quite different, though. After kneeling before the doorway I felt a strange, dizzy feeling. Within a few moments I felt as if I were �free falling� forward. As this occurred I clearly heard the type of sound you might hear as a tire looses pressure. A hissing, whistling sound was around me. It was dark for a moment, then as I regained my composure I could see stars, galaxies slowly rotating, brilliant gas clouds and the extreme expanse of space between these objects. I was moving – at what seemed like a rapid pace – through this scene. The sound continued. I can’t determine the amount of time spent moving through this region. It seemed that time held no place here. Ahead, I could see what appeared to be a large, brilliantly illuminated area. I was heading toward this and although slightly alarmed, could not do anything to change my direction. There was a passing through this – cloud – into a brightly illuminated, yet otherwise empty space. Then there was no perception of movement… I seemed to have stopped. The sound was the same, although somehow more musical. Almost like the ringing you might hear in your ears as you drop into a light sleep combined with the �hissing/buzzing. Everywhere there was brilliant light. My attention was then drawn “behind” me (there was no sensation of turning around or of direction – therefore, I use the word behind. There is no other way to describe this.) As I gazed “backwards” I saw a wondrous sight. Floating before me was a darker mass, slowly undulating. Visible within it were those stars and other objects I had passed. Beautiful and simple, it was seemingly held by a geometric spider web of light “tubes” containing what appeared to be dark beads moving through them. The movement was quick and orderly. Within moments I became aware of a presence. I have no idea what or who this presence represented- I was only aware of its proximity to me. I could feel it nearby. As I examined this view I clearly saw that the “webbing” was organized. To my surprise I saw the organized mature of the “webbing” was exactly that of sacred geometry. The shapes were separate tetrahedrons organized to completely surround (without touching) what appeared to be the universe. The presence wanted me know the universe was, through all it seeming chaos and order, always in balance. It wanted me to understand what I was witnessing, and instructed that the light tubes carried the essence of creation. That this was always surrounding and nurturing the universe. As I tried to understand the location of where I had traveled from, I considered the microbial size Earth must seemed from this point of observation (although it was not evident where Earth might be found within the mass) – and even smaller, those who live upon it. As I considered the relationships of size I became aware of the quantity of life that resided within this strange mass. I completely understood the fullness of life this universe held. My mind flashed on my wife, and those others who are important in my life. It was at that thought that I felt the movement begin once more. I reentered the “universe” and once again found myself moving past all I had seen previously. After some time I saw our star and then the Earth. So rapidly I cannot explain, I moved toward the Earth and the doorway where I had started this journey. I was once again in the doorway. Once I became settled that I had stopped my decent, I found myself looking toward the silhouette of distant mountains and Lake Titicaca. My hands were upon the stone as before — except to my alarm, I was inside the stone looking outward. My heart raced. As I considered this event I saw myself starting to appear on the other side of the doorway. Without any warning or sensation, I was again outside. I removed my hands from the rock and moved backwards. Sitting on the dusty rock floor in front of the doorway, I gazed upward toward the stars, considering all that had happened. “I’m back…,” I quietly whispered. I felt it a struggle to move or speak. As I moved closer to my wife I heard her quietly sobbing. I moved closer. When asked if she was all right, I was told how she had seen me vanish. One moment I had been there and the next I seemed to fade away. “Where were you?”, she asked, “I was afraid you might not come back…” It was clear that she had been frightened by what she had seen. I tried to explain but couldn’t relate my experiences to her. I needed time to think. I needed time to understand how to put into words what I had experienced. I believe this doorway is a transdimensional passage. The knowledge of how it is used is not lost – only hidden, kept from us. And, why not? Are we really prepared to go where this doorway takes us? I agree, there are those who are becoming prepared, through their wisdom and greater understanding of consciousness. However, there are a majority of those who are not in the state of mind that would allow for their passage. If they could go through, what would become of the numerous, inhabited worlds? I do not believe that our world is ready for that expansion without peace first being a standard on our world. As a race we have not gained the insight necessary to go beyond our own shores. 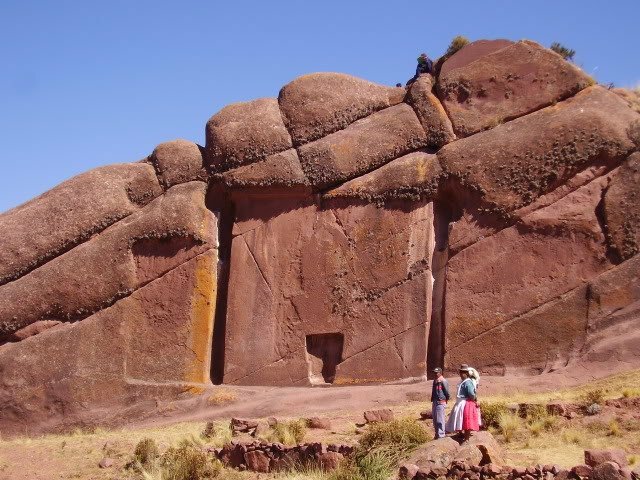 Perhaps this is the reason why the doorway of Aramu Muru is placed away, high and somewhat hidden within the Andes Mountains. To get there one must have reached a special point of understanding. And to use this artifact correctly, one must have wisdom. We arrive at this goal through lifetimes of experience and a desire to see our greater abilities, attempting to not only change ourselves, but to influence others in a passive way through our example. My hope is that those who travel to this remarkable place will preserve it. It is a fragile piece of our history and an important part of our future. 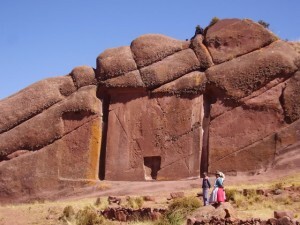 There is another, more powerful doorway called Marca Huasi that I have visited. It too is deep within the Andes Mountains. Click here to go to the second Doorway and information request form. 2012: Artifacts in Guatemala point to an advanced civilization in place 2,500 years ago, earlier than had been believed.